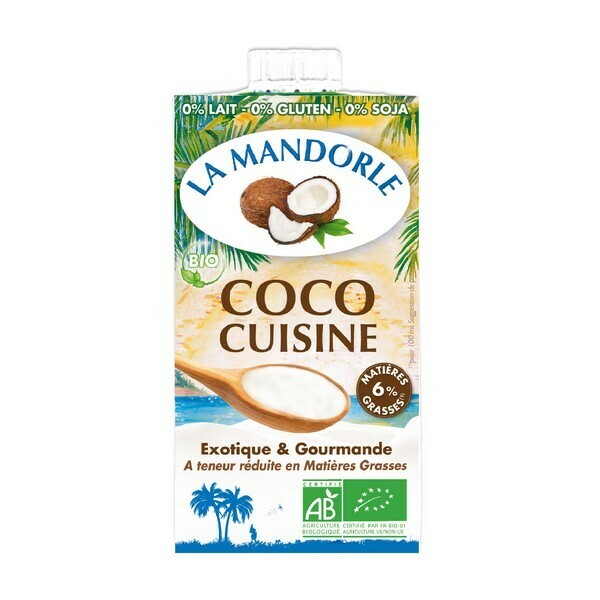 The La Mandorle light coconut cooking cream has a delicious creamy texture to add to all types of desserts and dishes, it is light and healthy, an ideal alternative for those who are allergic or intolerant to animal milk. Naturally lactose free, gluten free and soya free. Made in France. Carton 25 cl. - Ingredients: Spring water, coconut pulp * partially defatted (5%) , thickener: carrageenan , xanthan. - This cream is the perfect alternative to animal cream, try it on vegetables, quiches, desserts and many more things! - Coconut Cooking Cream: Can be incorporated according to the recipe to replace other cream products (such as vegetable purees), or to thicken combined with the use of flour or starch grains (custards, bechamel) or egg yolks (desserts, pies, quiches etc). - Shake well before use. The eventual decantation is linked to the natural composition of the product. After opening, keep refrigerated and consume within 3 days. Today, La Mandorle has expanded their range, from their diary free milk products to, milk shakes, instant breakfast products, spreads, creams for cooking, extra virgin oils and many more items! La Mandorle is committed to meeting its quality standards and ethics while developing Innovative Health foods in a natural and organic way. Natural quality products, produced with a manufacturing process that respects the environment and preserves nutrients and packaging that respects the environment with eco-global approach.